In 1903 the French Government, having what it felt was an adequate heavy machine gun, started looking about for a machine rifle as a companion arm. Of the numerous types taken under study, the French Army board became interested in an extremely lightweight automatic arm that could be fired cither single shot or full automatic and be carried by the soldier with as little difficulty as the standard infantry rifle. It became known as the Chauchat. O j onstrated a similar design at an earlier date. 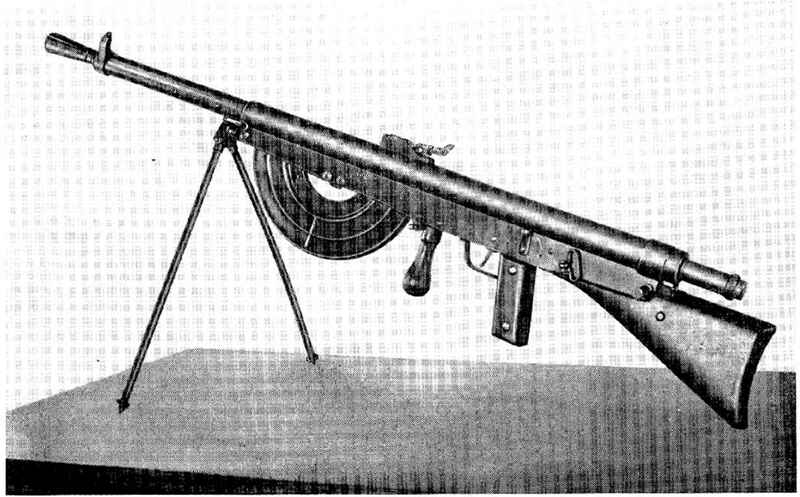 The fact that this machine rifle employed the long-recoil system for its operation is in itself of great interest, as it represents the only automatic machine gun ever produced by 1 ranee that did not use gas as the actuating force. Although it has been experimented with by inventors of every country in the world, the French for some reason have always looked upon the operation of machine guns by gas as a specialty of their own. That they should deviate at this time indicates an outside influence in the matter of design. Cheuchat Machine Rif.e, Model 1915, 8 mm.